How did, Arteria Boulevard, this community's southerly boundary come to be? On March 13, 1883, an Act of the California Legislature entitled "An act to provide for the organization, incorporation and government of municipal corporations," gave the voters the right to petition to become a city. Supervisors also established the boundaries of the proposed municipal corporation. November 25, 1912 was the date set for an election within the proposed boundaries, and to determine whether the town should be incorporated. On December 2, 1912, returns were counted and the County Board of Supervisors, with a unanimous aye, ordered that all the territory situated in the county of Los Angeles, State of California, and within the boundaries so described, was a duly Incorporated Municipal Corporation of the sixth class, under the name and style of "City of Manhattan Beach." With the election and incorporation, Gould Lane (now known as Gould Avenue), became the official southern boundary line for the City, this corridor was also the northern boundary line of Hermosa Beach. The center line of Gould Avenue went east from Sepulveda to Dewey Avenue, which became Aviation Boulevard. However, it would not be until 1934, when the State of California provided employment to local workmen to improve Gould, one of the original roads in the area. Many events took place on Gould Lane during World War II, which made headlines. A Redondo Beach couple in a coupe with blue cellophane over the headlights passed the intersection of Sepluveda Boulevard and Gold lane. Thinking they were shielding their car lights, the couple did not realize that blue light travels farther than white light and thus makes an effective signal for ships off shore. A 19-year-old Army private, Eugene Tuttle, signaled to the couple to halt. The driver mistook the soldier's warning signal for a hitchhiking gesture and kept on driving, where upon the soldier fired a rifle shot, fatally wounding Mrs. Brandel. The private was turned over to the Army, who blamed the incident on a missing Hermosa Beach motorcycle officer, who could have chased down the misinformed driver. After the War, land development once again went into high gear. A tract of land facing Gould Avenue, now Artesia Boulevard, was found to be the only property large enough for a high school site. Prior to the internment of the Japanese-American citizens, the 40 acres were owned by a Japanese-American family, who had earmarked the property for a nursery and landscaping business, however upon the owners return the acreage was sold to the school district. There were many obstacles that had to be overcome in order for the school to be constructed; sewers, utilities and water supply had to be installed. It was also at this time that Gould Avenue and surrounding streets would be improved, and made adequate for commuter traffic. 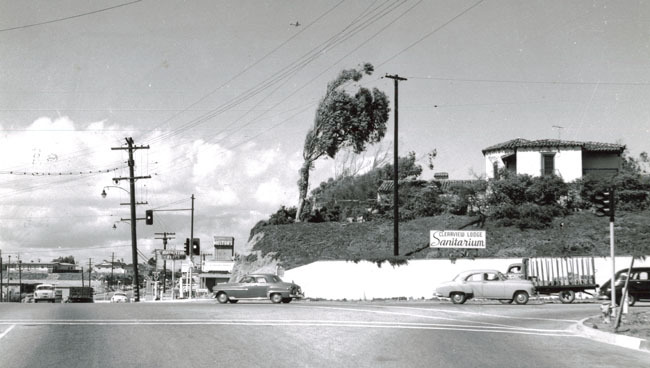 In 1970, at a cost of $26,000, the median strip of Artesia Boulevard was landscaped from Aviation to Sepulveda Boulevard. Today, Gould Lane running west from Sepulveda Boulevard is located in Hermosa Beach and still serves as one of the main entrances into Hermosa and Manhattan Beach.